Baptism is the Church’s way of celebrating and enacting the embrace of God who first loved us from the moment of our conception. The water of Baptism represents the washing away of life without God, cleansing, growth, and new life. The Baptismal candle symbolizes the “passing of the torch” of Christian commitment to those being Baptized, while the white garment represents the Church’s belief that Baptism sets us free from Original Sin. Infant or Adult Baptisms: Please contact the office at (317) 831-4142. The Sacrament of Confirmation is one of three Sacraments of Initiation and is the full outpouring of the Holy Spirit, necessary for the perfection and completion of Baptismal grace. Baptism, Confirmation and the Eucharist are a unity of sacraments that bring us into the Church. Like Baptism, Confirmation imprints a permanent, indelible mark on the soul, and because of this permanence, Confirmation is only received once. Most people receive the Sacrament of Confirmation as a youth. At St. Thomas More, Confirmation is generally celebrated by students in the 10th grade. All Catholics (age 18 and older) who have been Baptized, received First Eucharist and are practicing their faith but have not celebrated the Sacrament of Confirmation are invited to participate in a preparation program. 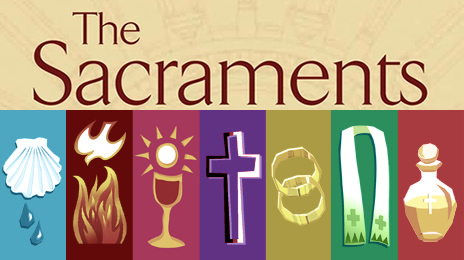 Preparing your child for the sacraments is a partnership between family and parish. Baptism was the first step in your child's journey toward full initiation into the Catholic faith. Coming to the table of the Lord in the Eucharist is the next sacrament of initiation, followed by the sacrament of Confirmation (celebrated in the teen years in the Archdiocese of Indianapolis). First Reconciliation is celebrated prior to First Communion. First Communion is generally celebrated in the 2nd grade. The Rite of Christian Initiation of Adults (RCIA) is the process established for the universal Church for individuals to become Catholic and receive the sacraments of initiation: Baptism, Confirmation and the Eucharist. For more information, please contact the office at (317) 831-4142. Communion to the sick and home-bound. If you would like to have Communion brought to the ill, home bound, or hospitalized as well as those in assisted living communities and nursing homes. For more information, please contact the office at (317) 831-4142. First Reconciliation preparation is designed to prepare children for this healing and forgiving encounter with Christ. All children who wish to receive First Communion must first prepare for the sacrament of Reconciliation. First Reconciliation is generally celebrated in the 2nd grade. For requirements and schedule please contact the office at (317) 831-4142. This program is a no pressure class designed to inform and instruct new believers or believers from other Christian denominations or religions about the Catholic faith. After the completion of the class, members are able to fully join the Catholic Church by receiving the Sacraments of Initiation (Baptism, Confirmation, Eucharist) and are then able to fully join the parish in all parish events, and most importantly to participate fully in the Holy Mass. For further information please contact the Office at (317) 831-4142. ​Matrimony (Marriage)What is the sacrament of Matrimony? Engaged couples are encouraged to contact the Office at (317) 831-4142 as soon as they begin plans for their marriage, at least one year in advance. In order for engaged couples to ready themselves for marriage, they participate in our Catholic Marriage Preparation Program. The couple is assigned a sponsor couple who facilitates the program. The engaged couple and sponsor couple meet several times prior to the "Big Day." During these sessions, different aspects of Catholic married life are discussed. The sessions focus on the four main areas of Marriage and Faith, Marriage and Communication, Marriage and Sexuality, and Marriage and Stewardship. Church teachings about married life are shared and discussed. In addition to Church teachings, sponsor couples also share their own experiences as man and wife. One of the beautiful things about this program is that as the sponsor couple helps the engaged couple, they find that they strengthen their own marriage. For more information, please contact the Office at (317) 831-4142. If you were married outside the church and are interested in celebrating the sacrament of marriage, please contact the Office at 317-831-4142. ​What is the sacrament of Holy Orders? There are three levels of Holy Orders - bishop, priest and deacon. Just as Christ came to "serve and not to be served" these men are called by God, through the power of the Holy Spirit, to be servant leaders for the faithful. Their powers and responsibilities are conferred through the sacrament of Holy Orders. Only a baptized, Catholic man who is called by the Church to be a deacon, priest, or bishop can be validly ordained to that ministry. The Anointing of the Sick is a sacrament of the Church, instituted by Christ, in which the priest prays, lays hands, and anoints the sick person with blessed oil. The Anointing of the Sick can be received by any Catholic whose health is in a critical state. If you are experiencing illness, injury, impending surgery or weakness due to age, there is powerful help available for you here in the Church. One can receive the Anointing of the Sick several times in one's life. As soon as anyone of the faithful begins to be in danger of death from sickness or old age, the fitting time for him to receive this sacrament has certainly arrived. Viaticum is also known as the last sacrament of the Christian. It is the last Holy Communion that a person receives before dying.